Renowned for its lively atmosphere (although now quieter than it used to be) and high-value skiing, Sauze d'Oulx is also at one end of the Milky Way Circuit. Conditions permitting it is possible to ski all the way to Montgenèvre, France. Sauze d'Oulx claims to be the birthplace of Italian skiing, dating back to 1899. When will it snow in Sauze d'Oulx? 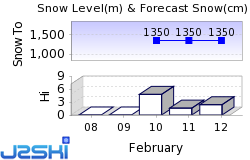 The next notable snow forecast for Sauze d'Oulx is 3cm1in, expected on 22 April, with around 7cm3in forecast over the next 7 days. How High is Sauze d'Oulx? The Italian Ski Resort of Sauze d'Oulx is part of the Milky Way ski area with access to 933km580 miles of downhill skiing, with 598 marked pistes, served by a total of 175 ski lifts. In addition to the skiing in Sauze d'Oulx itself (400km249 miles of pisted ski runs), the appropriate ski Lift Pass will allow you to ski or snowboard in the other Milky Way ski resorts of Clavière, Sansicario, Sestrière and Montgenèvre. The ski resort itself is at 1,510m4,954ft, so skiing or boarding back to the resort is usually possible. With ski lifts as high as 2,800m9,186ft, skiing and snowboarding is assured throughout the season. Sauze d'Oulx, pronounced Sow-zee-doo was one of the most successful Italian ski resorts on the 1970s and '80s, expanding rapidly. Located on a high sunny 'balcony' in the Susa Valley, the resort is surrounded by larch forest above. The trails cut down through this natural amphitheatre have an excellent snow record. Its success resulted from its large and varied ski area, linked to Sestrière, its lively night life and reasonable prices. The resulting growth has led to the construction of a large number of rectangular concrete apartment blocks, mirroring its French partner, Montgènevre, now lift-linked to Sauze at the other end of the long Milky Way circuit. Although Sauze still has a delightful ancient heart of stone buildings, narrow streets and a cobbled square with water fountain, as well as locals prepared to dress in traditional attire for ancient festivals, these are all somewhat swamped by the newer developments all around. In recent years Sauze d'Oulx has matured a good deal, and although the resort is still one of the liveliest ski centres in the world, the occasionally unpleasant 'rowdy' element has moved on. It remains a very popular destination none the less, with most of the major international tour operators including it in their resort lists. Skiing has been popular here for over a century and world champions like Piero Gros, a gold medalist of the 1976 Olympics, have been based here and most recently the resort was a venue for the 2006 Winter Olympics. Skiing first began on the local slopes at the end of the nineteenth century when a Swiss engineer, Adolfo Kind, taught skiing to locals and guests using wooden boards strapped to the feet. The longest possible descent in Sauze d'Oulx is 5km3 miles long. Sauze d'Oulx's ski area can be accessed from four different points around the village, all served by chair lifts and linked at resort level by a ski bus. As the resort is built on quite a steep hillside and all the lifts leave from the upper outskirts of the village, this bus is invaluable for many guests. Beginners have a village level nursery slope at the base of the Clotes chair, but most teaching takes place at Sportina, a plateau area half way up the mountain from which many lifts radiate out and there are a number of short beginner drags. Sportina can be reached quickly by a quad chairlift. Intermediates will get the most out of this great varied terrain and enjoy the feeling of travel over to the neighbouring areas. These include Sestrière's famous slopes and the long reds above down from Fratieve to Sansicario. Reasonable intermediates can make the Milky Way link in reasonable snow conditions by skiing over to Sansicario, taking the (Unskiable) chairlift link across the top of Cesana and then skiing on above Clavière, Italy's oldest ski centre, over the border to Montgenèvre in France. Expert skiers will find some fun off-piste amongst the larch woods of the lower slopes or up in the higher powder bowls. There are a variety of off piste routes which a guide can show you that descend 1300m from the top of Fratieve to the valley. Excursions to Val Thorens are sometimes organised, thanks to the lift access from Orelle in the 'fourth valley' that runs to the Italian border and links in to the Trois Valley circuit. A terrain park was first added for the 2006-7 season complete with jumps and rails. Sauze d'Oulx was one of the last of the world's major resorts to add a pipe. For free riders the varied terrain, packed full of natural features, makes Sauze a popular destination for 'boarders. The non stop après scene is a big factor too. Expert 'boarders will enjoy the off piste opportunities in the trees on the lower slopes or up in the wide open runs at the top of the area. When is Sauze d'Oulx open? We don't currently have confirmed season dates for Sauze d'Oulx. NOTE:- Lift and Piste openings are always subject to Snow Conditions in Sauze d'Oulx. Sauze d'Oulx is able to make snow, on 15km9 miles of ski runs, with 950 snow cannons. The 22 ski lifts of Sauze d'Oulx are able to uplift 70,900 skiers and snowboarders every hour. Sauze d'Oulx is in the Italian Alps in Turin, Piedmont, Italy. The nearest airports to Sauze d'Oulx are Turin Caselle, Chambery and Turin Cuneo. There are 10 airports within three hours drive. Still Italy's liveliest ski centre and up there with St Anton, Chamonix and Sölden in the global rankings. The choice at Sauze is large and includes the Cotton Club for Acid Jazz which has been operating for more than 30 years now, for a British pub like atmosphere, the Max Bar with satellite TV and live football, cocktails at Moncrons, or the Gran Trun wine bar which usually has live music. If you like your bars on the Irish theme head for Paddy McGintys, For a quieter atmosphere Miravallino has a tea room with a bar service. Many of the bars continue with dancing into the small hours but there are dedicated discothèques too, including Banditos and Schuss. Other popular Ski Areas near Sauze d'Oulx. Want to ask about skiing and snowboarding in Sauze d'Oulx? Or contact Sauze d'Oulx Tourist Office. Note :- The information on J2Ski concerning Sauze d'Oulx, where not clearly factual, is opinion only and is neither definitive or exhaustive.